The coldest months of the year turn rivers, lakes and ponds into solid playgrounds for winter sport. Snowshoeing, cross country skiing, skating, ice fishing, and snowmobiling are all very popular activities when ice forms. Before you set out across the ice it is important to spend a few minutes of your time to size up the conditions. It may look very safe from the shoreline but venturing out you might find yourself up to your neck in ice water. At the minimum it will end your recreation for the day and at the worst it will end your life. There are two old sayings about crossing the ice, "thick and blue, tried and true - thin and crispy, way too risky," and, "when in doubt, don't go out." Both of these are excellent bits of advice. The first thing you should do is take a look at the ice before setting foot on it. Clear blue or blue black ice free of snow, air bubbles or debris is the strongest. Ice that is white, brittle, mixed with snow, or filled with air bubbles isn't as strong and won't hold as much weight. 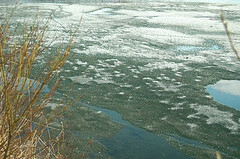 Ice that is white and brittle is often referred to as, "rotten ice." Ice is actually very complex. Factors including water currents and depth, snow cover, and temperature all effect how strong ice is. It takes two to three weeks of temperatures below freezing to make deep lake ice capable of holding up a large amount of weight. New ice is stronger than old ice. If you're not familiar with an area talk with local officials, bait shops, or check with the local police department on ice thickness. Less than three inches of clear blue ice. This ice is unsafe! Ice under three inches can break any time under the weight of an average person. Some people may tell you that on cross country skis or snowshoes as little as two inches of ice can hold you up because your weight is distributed better, we think that is pretty bad advice. Three to five inches of clear blue ice. This ice is capable of holding up a human safely. If you are traveling in a group be sure to spread out as several people standing together will put stress on the ice. Six to eight inches of clear blue ice. This ice is capable of holding a group of people or equipment like an ice fishing shack or skimobile. This is the minimum thickness needed if your plans including playing a hockey game or other group activity. Eight to twelve inches of clear blue ice. This ice is capable of holding up the weight of a car. But ask yourself, "do I really want to drive my car onto the ice," and if it did a submarine imitation how would you explain it to your insurance agent. A car creates a pressure wave as it moves across the surface of the ice. If the water is four feet deep driving any faster than nine miles an hour can shatter the ice around you. The pressure wave advancing under the ice becomes so strong it strikes the lake bottom and returns to the surface, cracking the ice. The deeper the water, the faster you can go. Also be sure that you don't park in the same place for long and keep cars spaced out at least two hundred feet apart, especially when parking. As the car sits in a parked location the ice will start to sag. Ice thickness isn't a constant on a body of water. Snow cover actually acts like a blanket insulating the water below. Springs and currents can create areas of extreme thickness and patches that are just wafer thin. Snow cover also hides the surface and can mask rotten ice and thin spots. You should always be cautious as you move across snow-covered ice. Learn more about ice safety NOW!